Fun Home falls into two categories for discussion. That in which it is a near perfect example of contemporary musical theatre. It is 90 minutes of perfectly balanced and pitched book and music. It challenges an audience without being pretentious, it’s intellectual without being inaccessible. And as a piece of musical theatre it is brilliantly crafted to offer everything a musical should, but in a format that twists expectations just enough to be fascinating yet work perfectly. 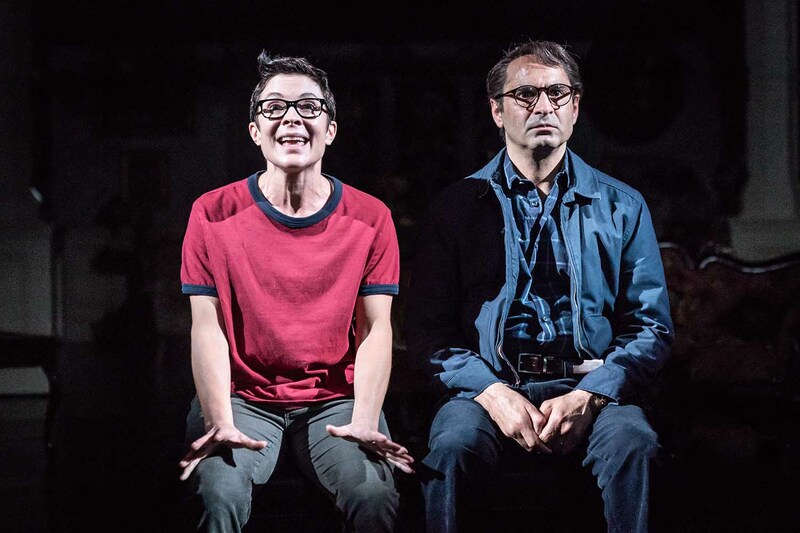 The thing about the way Fun Home is crafted is it does exactly what musicals are designed to do, what every old-fashioned song and dance musical does- it just does it quietly, with what is in essence a domestic drama. It dramatizes through song. All the songs are the things that can’t be said out loud- from the early refrain of Bruce singing to himself, tragically, the refrain ‘I might still break a heart or two’ while his wife mirrors the tune, without lyrics in the background. Later, she will finally sing all the things she has not been able to say for twenty years. Meanwhile our narrator Alison, has her parts sung for her by Little Alison and Medium Alison, all the thing she can’t articulate. She says she doesn’t remember clearly. Big Alison only really sings at the end, to deliver us that final tale of her and Dad. All the things she cannot say. None of this is any different to the love laments of a big song and dance musical, the music gives them freedom to say the things never expressed. It’s just that the scenes in the book, that they speak to each other without song, are so perfectly repressed, the story so subtly woven. We know the ending from the outset. And it’s perfectly paced to take us on that journey. Alison narrates it for us, and as we travel along that road with her. And we realise it’s about more than ‘my Dad killed himself and now I’m a lesbian that writes comics’. It’s about the complexities of families, about growing up, growing away, about being yourself and navigating the world. And not a single character is left out. Most beautifully written in fact is arguably Helen, Alison’s mother. We hear little from her for much of the story. She is often literally placed in the background. And yet when she steps forward to sing ‘Days and Days’ everything she has done for the preceding hour- especially in the hands of Jenna Russell- falls into place. It is a meticulously crafted role, and performance in a musical that doesn’t waste a single note or moment to weave this story. Nothing is extraneous here, every detail matters. That in itself seems to form a metaphor for family life, for growing up, for being yourself. For the Old Vic Production, Kaisa Hammarlund holds and weaves together this deceptively complex musical together. Her narration, while also inhabiting the role, reacting to the story of Alison at different times, was a subtly brilliant piece of work. Director Sam Gold created a production that lets the story take hold, but also take centre stage. The subtle framing that mirrors comic book panels. A stripped back staging until it isn’t, evokes Alison’s memories faded and strong. The slightly surreal nature of scenes, keeping us within Alison’s mind as she struggles to recreate the details. All of it is directed with a subtle sensitivity that knows the power of the work, letting it breathe and speak for itself. 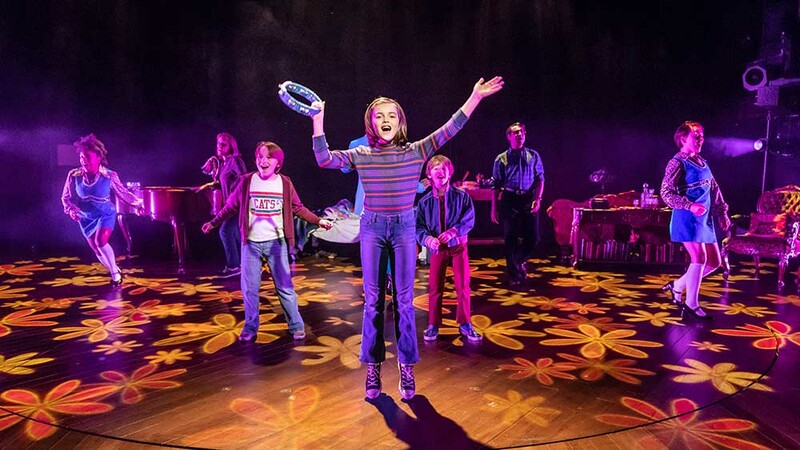 Fun Home is rightly considered a contemporary musical theatre classic. By any rights it will go down in history as a game changer, for not it’s content, though that’s important, but for being an example of what contemporary musicals can and should be. Some might dismiss it as pretentious, overly intellectual. I suggest that for these people, they simply don’t connect with what is at its heart an incredibly emotional piece of work, and an important one for those who do. To those I’d say, it’s not for you. And I mean that literally. It’s not written for you. And that’s ok there’s plenty of work written for you. Or perhaps you can’t see that it’s for you too, and that’s less ok, but maybe come back one day and it will be. 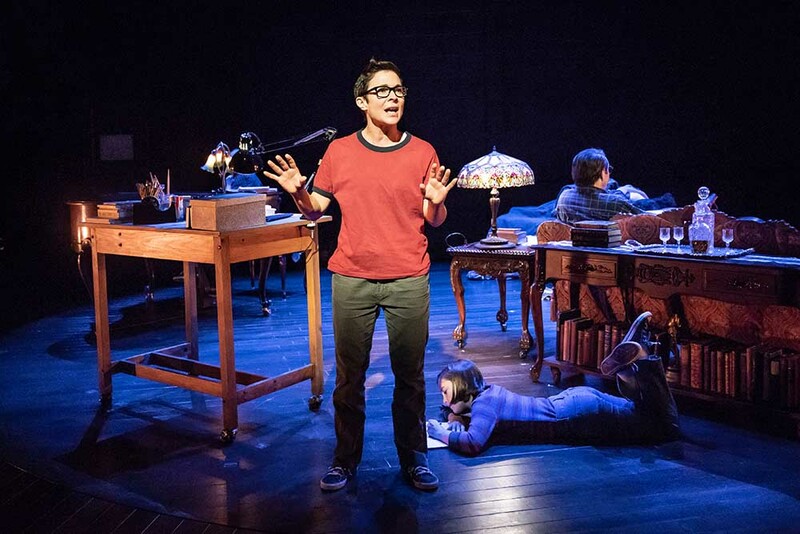 Because despite what I’m going to say next, Fun Home isn’t just about being Queer. Or even an academic cartoonist. Or having a dead Dad. It’s about so much more. That said there’s a searing honesty that is brutal and wonderful all at once about the story of Alison’s father. ‘Telephone Wire’ is what it is. The chaotic memory questioning was that the last conversation, the frustration and the pain of not getting that moment of ‘goodbye’ that, ironically, plays and films tell us we should have. Instead Alison gets a frustrating conversation, or lack of that she doesn’t know will be the last. But Bechtel is too smart to fall back on a message of ‘tell the people you love them’ because that’s not real. Instead it’s a frustration, Alison struggles to find an alternative, that she’s misremembered, that it really wasn’t their last. As well as the complicated anger at her Father, for who he was, what he hid and how that affected them all. 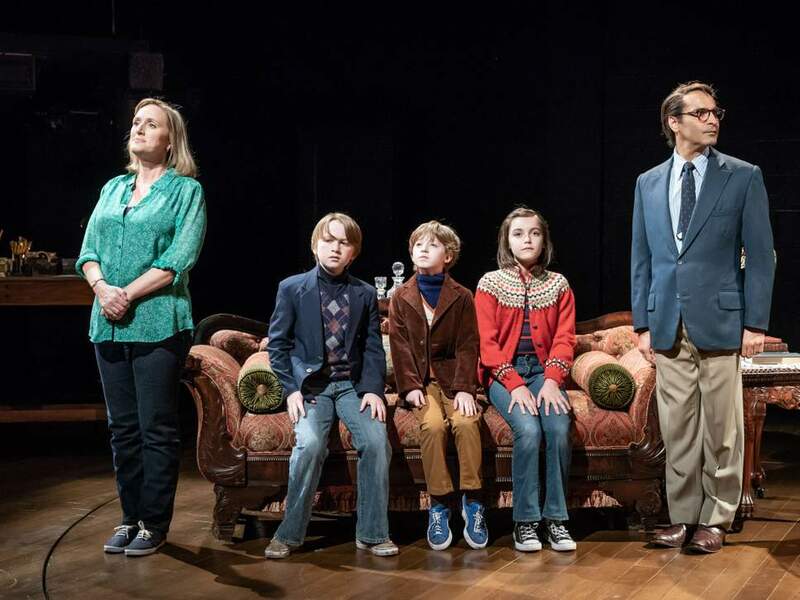 Fun Home is about families. About what we repress. What we say and don’t say. The secrets all families have. The damage we do to each other. And what we might do to heal. It’s about being who you are. Or being who you’re supposed to be. It’s about grief and loss. In its literal form, and many other forms. If you can’t see past the lesbians and the funeral home for all that, that’s a shame because you’ve missed out. But that’s ok, maybe you aren’t ready yet. It’ll be here when you are. Fun Home is for everyone. But for some it will always mean something a bit more. Alison Bechtel gave all of those women that moment Little Alison was having: I have seen, and I feel seen. And I don’t feel alone. That moment sums it up but it’s in the little details. Yes, some of us look a lot like this version of Alison (basically dye my hair and it’s like looking in a mirror- is it then narcissistic to fancy her too? asking for a friend…. ), it’s all the little jokes, all those little moments we recognise alongside the big ones. But it’s those things we’ve gone through. From being the girl forced into dresses. To creeping into the gay section of the book shop. To running away from the LGBT society at Uni (pro tip joining a theatre group is a low-key way to start). To writing that letter home. To going home for the first time again. And again, just to be seen. To be shown. But to be shown as a woman going through that. And to anyone who says ‘what does it matter’ you’ve never had to know that it does, and that’s great. But for the others in that room, that is a powerful, powerful thing. And then Alison sees someone who looks nothing like her. Like ‘none I ever saw before’ and she doesn’t know who this woman is, or where she’s from. But she knows her. And in the theatre, in that room it was powerful. From that start that sixth sense ‘I know you’ you could ask any person who got that, who else did and we could pick them out. It was in the things they laughed at, cried at, reacted to. ‘I know you’ all, in this room with me. And just like that Old School Butch walking into the diner, it’s so rare. But we know you. And all at once all our hearts are saying hi. 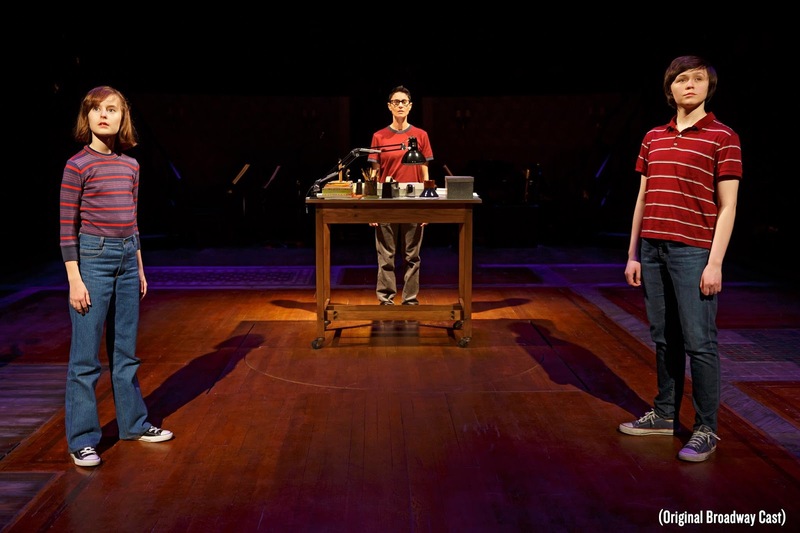 It’s impossible to talk about Fun Home without making it incredibly personal. And everything critical to be said about it has already been said. But it’s those personal stories that keep it urgent and alive. From the Queer women who see themselves in Alison, who needed to see a woman like her on stage, to the other Queer people who do too. To the men who may see some of Bruce in them, who he might help. To those who see Helen as them, their Mother or aunt, friend. To those who like Alison lost a parent young. Heck, to those who might have grown up in a Funeral Home. For me there was an intersection of far too much. And I cannot fairly write about this work without acknowledging it. As a Queer woman, I can’t claim every experience Alison has, but I have had enough of them. I identify as bisexual, but I have short hair and have never been a girly girl or a girl’s girl. Except confusingly in the way you’re probably not supposed to. Everything above rang so true, the need to be seen, the act of being seen on stage. But for me Alison’s tale rang incredibly true because as much as ‘Ring of Keys’ hit home, so did ‘Telephone Wire’. My Father also died when I was around the same age as Alison. And that was a moment of feeling as ‘seen’ as I did with ‘Ring of Keys’. I have never seen a story about a dead Dad that doesn’t command the children to weep and wail and be prettily devastated. Instead Alison is frustrated and confused. And that aspect of the story, this often-neglected story of losing a parent where at once a grown up but at once far too young to deal with, articulate it. That she has to do that years later. Doing that with an incredibly difficult and complex relationship with her Father. I love Bechtel’s take on that because it never rests on sentiment. It shows Alison’s frustration, anger, confusion. It’s not about breaking down and weeping, it’s too complex a relationship for that. It’s too complex a life moment for that. And perhaps it takes someone who knows it to articulate it. I never talk about my Dad dying, not because it upsets me, but because people expect it to. And they get annoyed, think less of me when it doesn’t. And because just because my Father died doesn’t make him a Saint. Far from it in fact. My story isn’t exactly the same as Alison’s in that respect, but I felt that keenly too. And in all of that we see her face that, by making work out of it. And maybe this is the element people find pretentious. But I find most real, most cutting. Not everyone will be a world-famous cartoonist, granted. But anyone in a similar situation would use what they have to make sense of it. And for me, when I saw this, I’d just come off some edits of a play that is I guess ‘my’ Fun Home. My letter to the Universe that tries to make sense of that time. And again, it’s that sense of ‘I know you’ seeing someone do that too. I didn’t see Fun Home in New York. Despite being there when it was on. I’m a firm believer that some pieces of work find you when you’re ready. It’s ironic that I have only been moved like that ‘in the room’ by two other pieces of theatre, one of which was Rent. I found Rent (or it found me) at the precise moment I needed it. And it’s stayed with me. 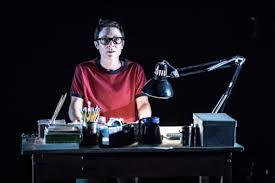 While I don’t intend doing anything so ridiculous as writing a PhD on Fun Home, there are works you see and just know are going to form a part of your DNA from now on. Because you see them and feel like they needed to be there all along. Fun Home was one of those. Oh, and as a final footnote. 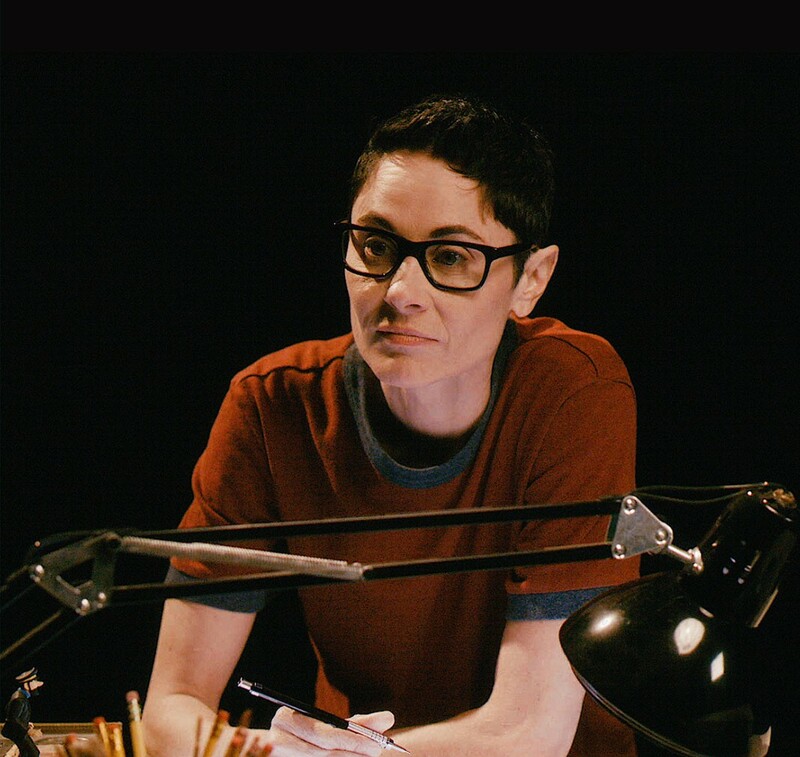 The original Broadway Alison is of course the astonishing Beth Malone. 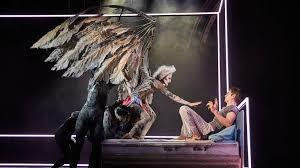 An intersection of worlds for me personally, as she’s spent this year flapping her wings as the Angel in Angels in America. So, it seemed right then, that when I should originally have been seeing Fun Home…I was on the other side of the Atlantic watching Malone instead.